Dim sum is by far my favorite cuisine. If you’re unfamiliar with dim sum, which is the Chinese equivalent of tapas, you can read a bit more about it here. In summary, most of the food is served in small dishes, and many of the dishes are either filled buns or dumplings. 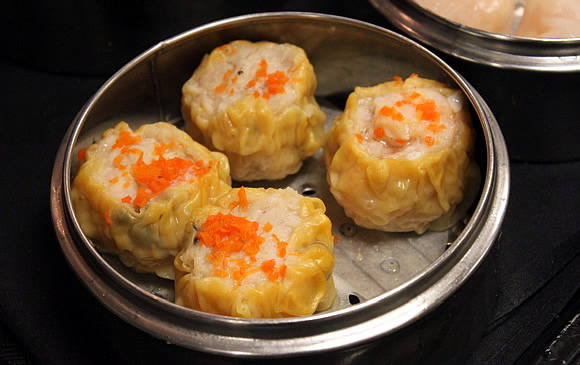 Siu mai (shumai) dumplings translate to English as ‘cook and sell,’ and are in Cantonese cuisine prepared with pork, shrimp and mushrooms. Covered with a thin layer of dough, they are either steamed or pan-fried. I could eat my weight in siu mai. At dim sum restaurants, each dumpling is artfully prepared, and a small carrot slice or pea, or small spoonful of roe, is placed on top of each prior to cooking. Making siu mai at home is a bit trickier, although all it truly takes is the patience to try to get your dough wrapped as neatly as they do in the restaurant. I’m yet to figure that out. The process here is much easier. This recipe takes the siu mai filling, and pan fries it in fritter form instead of wrapping it in dough. I did this out of convenience with my leftovers, since I had run out of won ton wrappers, but I ended up liking the final product nearly as much as I do steamed siu mai. Proof positive that food tastes extra good when fried in oil! This entry was posted in Cooking, Food, Recipes, Savory and tagged chinese, dim sum, dinner, food, fried, fritters, mushrooms, pork, recipes, savory, shrimp, siu mai by Emma Schultz. Bookmark the permalink.